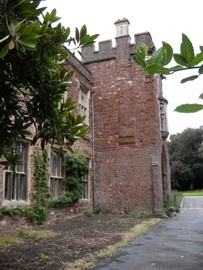 1653-60 The Bishop's Palace was used as a sugarhouse by FORD. 1971 Excavations here revealed a quantity of sherds of sugar moulds and jars. An industry linked to sugar refining here in late 17thC. The width of this map represents 5ml / 8km. Hoefnagel map, 1579 - my thanks to Richard Hyde. Bishop's Palace 2010 - © bryan mawer 2010. 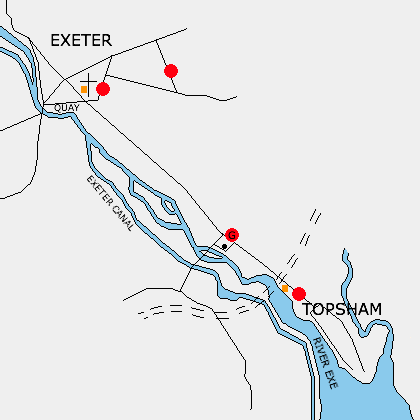 1971 ... "In the years between 1680 and 1720 several sugar bakers operated in Exeter and Topsham. The waste of one of their sugar houses was found in Goldsmith Street in 1971. ... 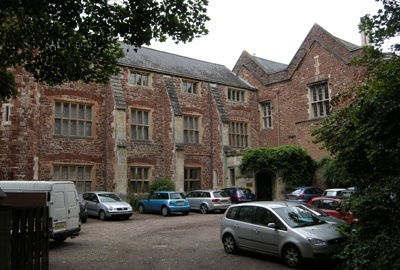 The Exeter finds include thousands of sherds of sugar mould, which seem to have been imported from Portugal, alongside many fragments of the syrup pots. "(4) There's an interesting image of moulds and pots accompanying this text on the website. It's unlikely there was a sugarhouse in or near Goldsmith St as it's too far from the river, but it appears to have been common practice to use broken moulds and jars for road building as well as for revetments and foundations for docks and railways. It's probable that the Exeter finds were from an early small sugarhouse, but by contrast when some of the London refineries closed mid-19thC there were often up to 30,000 moulds and jars to be disposed of from just one of them.